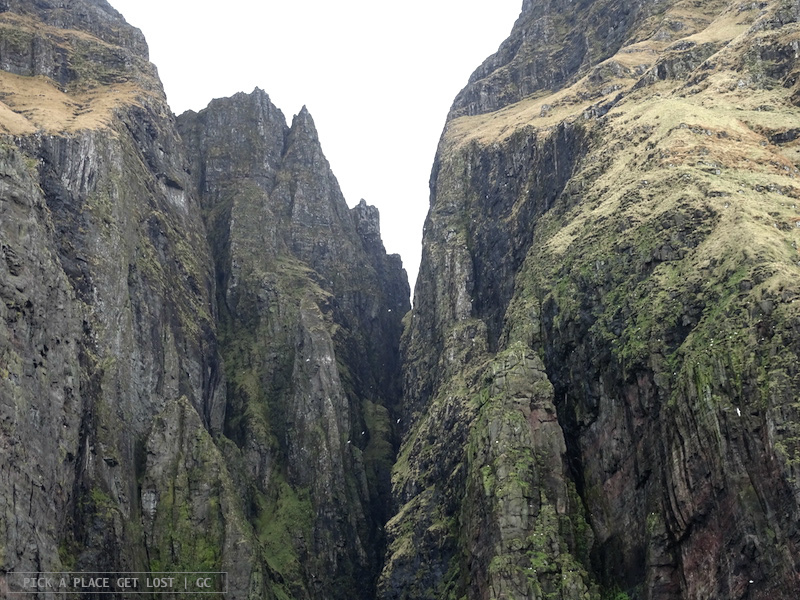 The trip to the Vestmanna Bird Cliffs came at least as unexpected as the one to Gásadalur the day before. The morning after the long walk to Gásadalur and Mulafossur waterfall, we left early (again) to take the bus to Sørvágur (again) and try our luck with the Mykines ferry (again). It was our last chance: we were leaving the islands the next day. 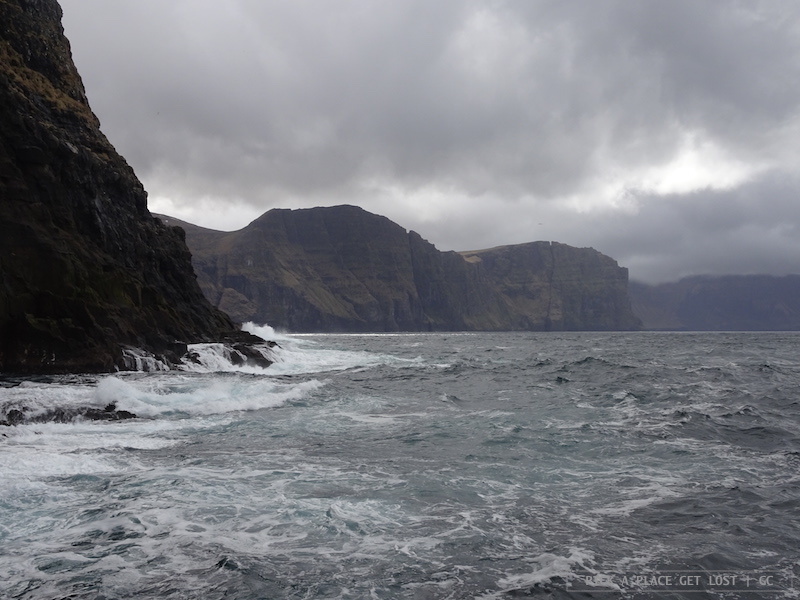 The day before, as we were walking through Bøur the second time, we saw the ferry out at sea on its way to Mykines. It left Sørvágur around 16.20, but we couldn’t board it then, because it wouldn’t sail back to Sørvágur again that day, and we couldn’t afford an extra overnight stay on the island. The ferry would only sail back to Mykines the next morning, i.e. just when we were hoping to hop on board as well. The weather was promisingly horrible from the very start: rain, mist, wind and grey, heavy clouds. 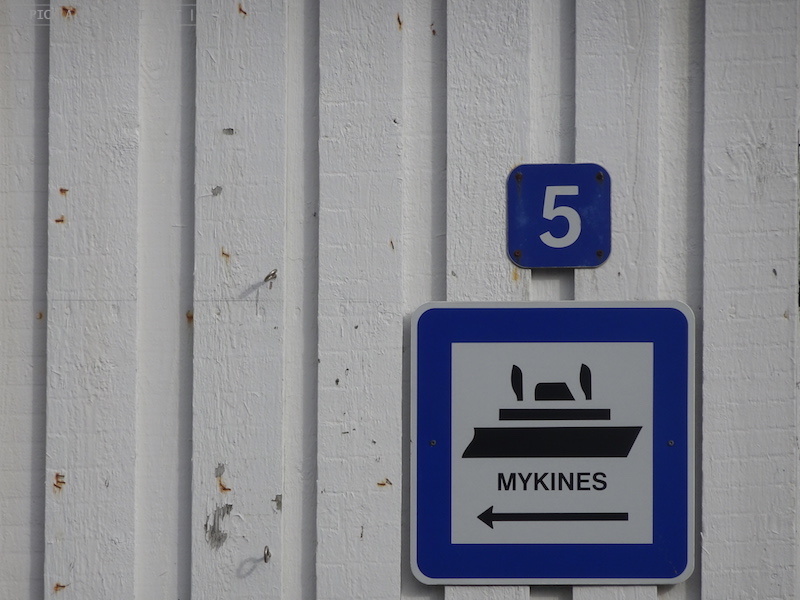 It was the worst combination possible for a ferry journey that’s as dependent on the weather as the Mykines one. 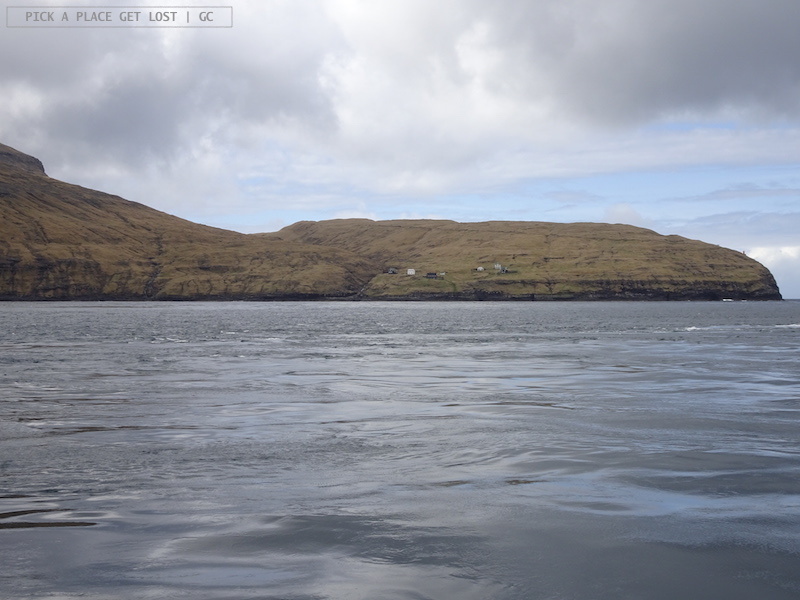 And yet, GreenGate Incoming (the agency we’d booked our Mykines trip with) informed us that the ferry appeared to not be cancelled. There was still hope. We reached Sørvágur again and, predictably enough, in came the update that, yes, the ferry had been cancelled because, well, look at the weather and you’ll know why. 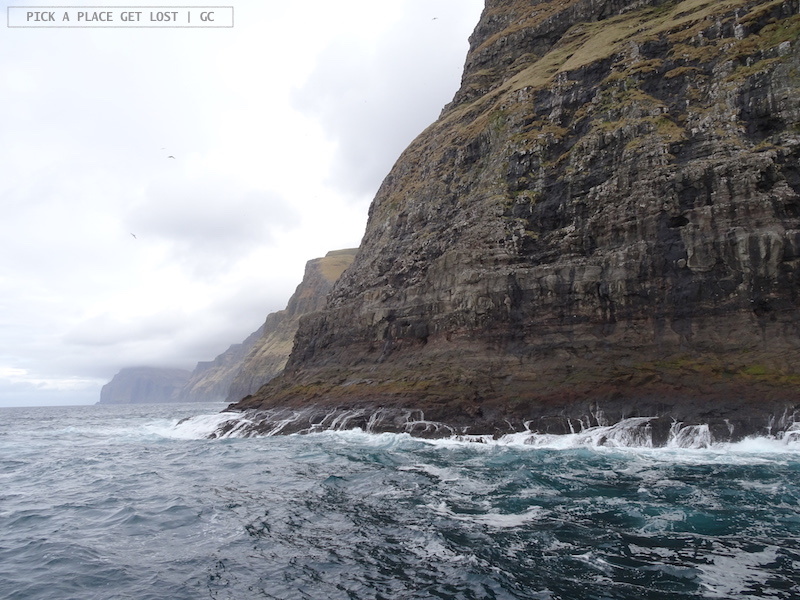 That’s when we realised that on our first trip to the Faroe Islands we wouldn’t visit Mykines. It would then have to happen some other time. That’s also when we realised, as we had the day before, that we didn’t have a plan B for the day. The day before, though, the weather had been amazing, so it had been easy to rearrange our plans on the spot when we’d learnt about the ferry cancellation. It wasn’t going to be as simple then: the weather was truly horrendous. We were heading back to the bus stop, when GreenGate Incoming emailed us again. They mentioned that the Vestmanna boat tour in the afternoon was not going to be cancelled, despite the bad weather, and they still had two slots available that day, should we fancy to join. Vestmanna is another Faroese classic. 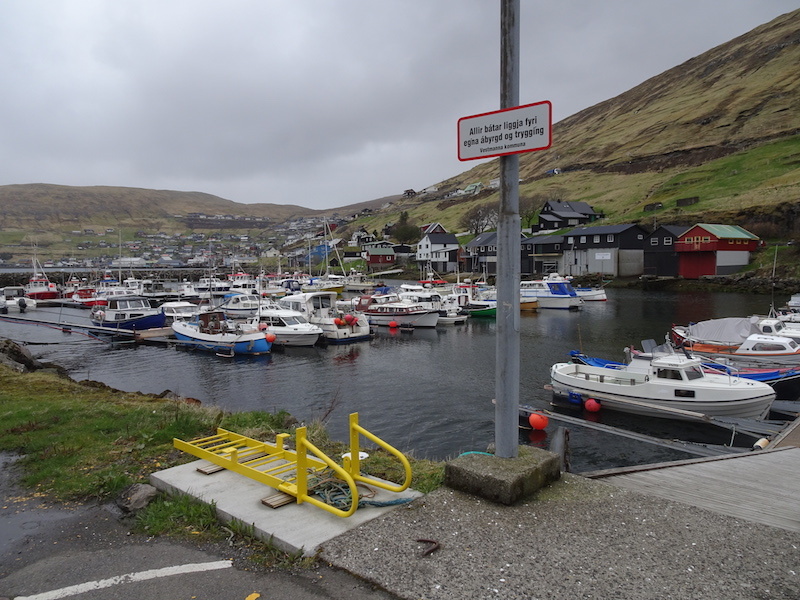 It’s a fishing village on the west coast of Streymoy island, the one where the capital Tórshavn is also located. 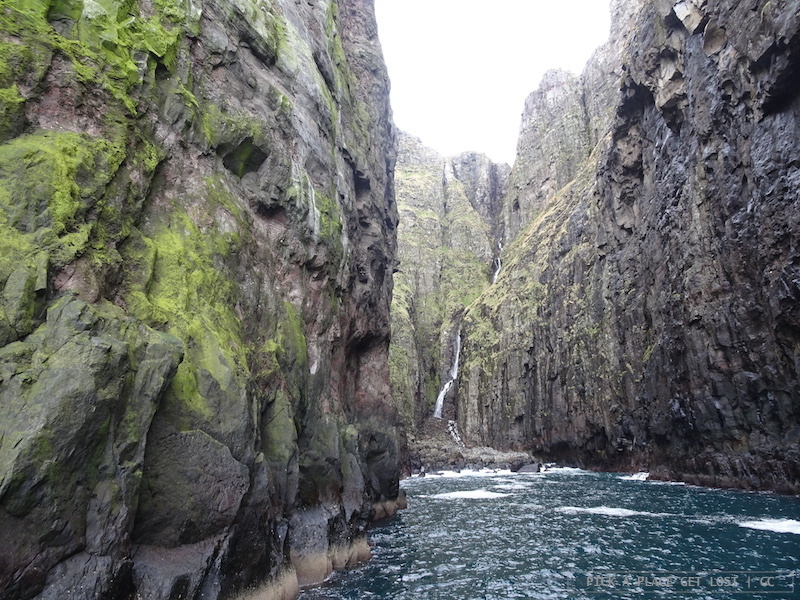 The village itself might not be exceptionally attractive, but that is where boats leave from to show you around one of the (countless) stunning places in the whole archipelago: the Vestmanna bird cliffs. The rock in the middle is known as ‘Elephant’ due to its shape, vaguely resembling an elephant. Well, Vestmanna was the least thing we had in mind that morning, but the way things were evolving, do you think we said no? Because we didn’t, we said yes! It took quite a long time to reach Vestmanna from Sørvágur. First we had to wait for the bus to Tórshavn. There we changed to another bus, which dropped us off at an intermediate stop by a petrol station in the middle of nowhere on Streymoy, just out of the tunnel from Vágar. There we hopped on a third bus, which did take us to Vestmanna, at last. In Vestmanna there’s one bus stop that’s very close to the landing pier next to the Tourist Centre. That is where the tour boats leave from. We ran to the pier in the pouring rain and, minutes after we (and a few other passengers) hopped on, the boat left. Unbelievably enough, shortly after we boarded the boat it also stopped raining. A few minutes after we sailed out of Vestmanna, passengers started going up on deck. And so did we: we picked our own spot at the very front of the boat. 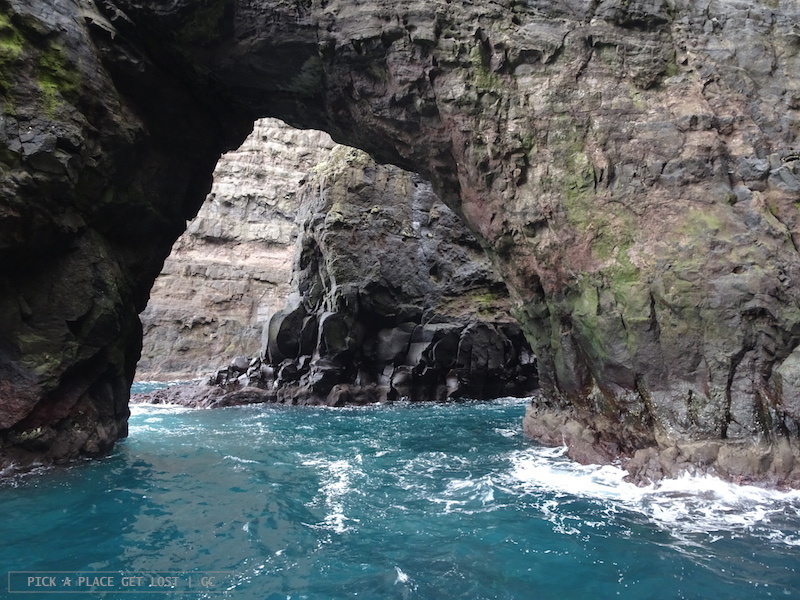 The boat sailed north toward the ocean, along unimaginably high cliffs, and into a couple of impossibly narrow straits. 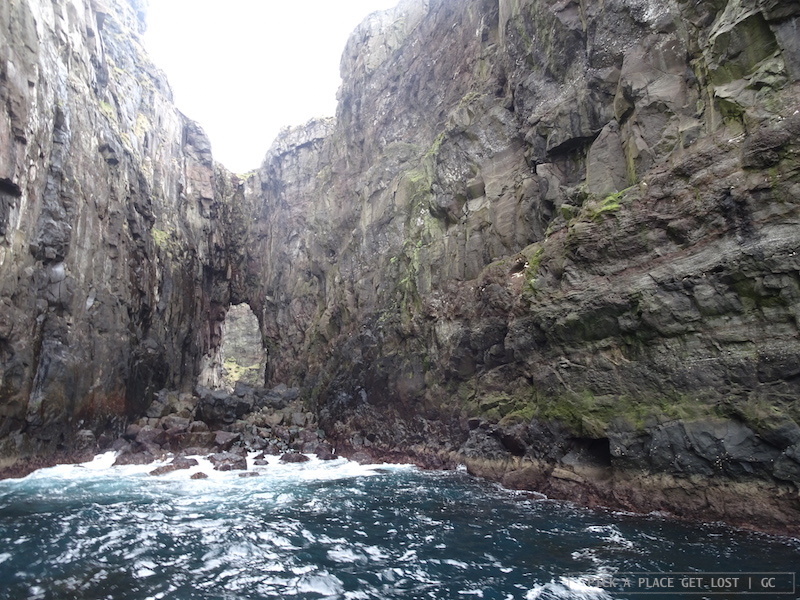 The cliffs are a favourite nesting place for seabirds in the summer months. 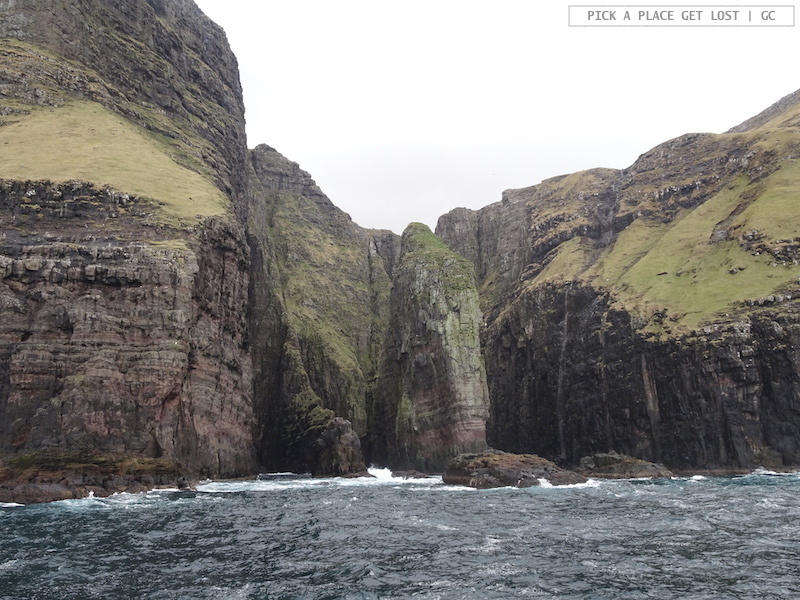 Look up toward the cliffs as the boat sails past, and you might see a lot of them! We didn’t see that many, in fact, but that’s because it was still early May, so the nesting season was only just beginning. 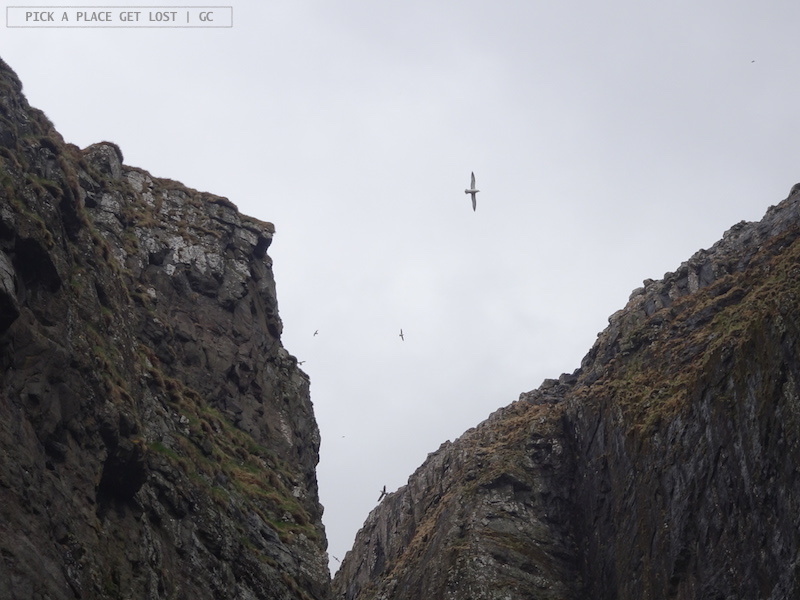 I have to say, though, we spotted two puffins! 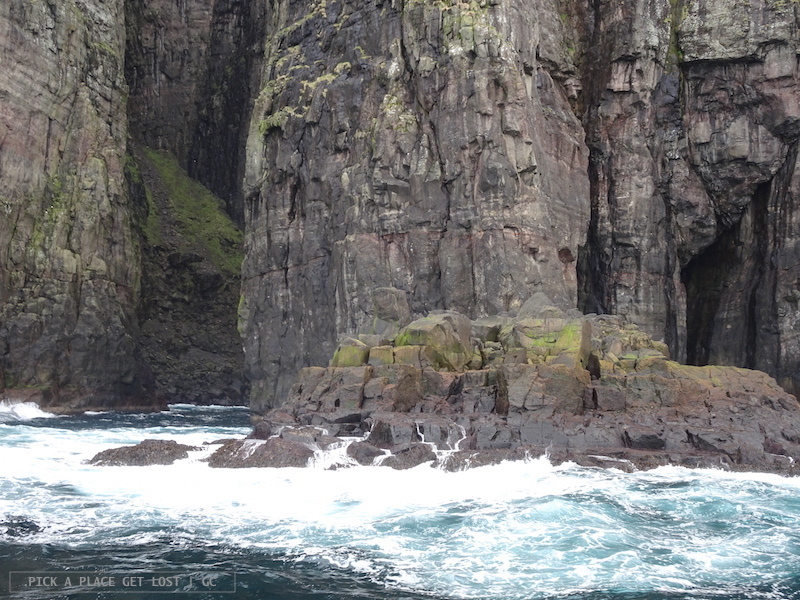 They zoomed past super quickly, so we weren’t able to take photos, but they were puffins indeed! 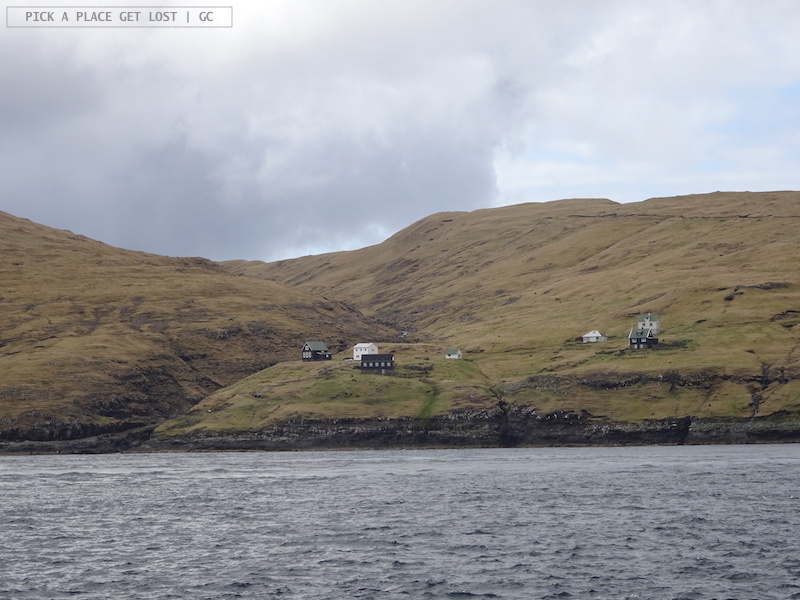 As the boat sailed up the Vestmannasund (Vestmanna Strait), we sailed past Slættanes, an abandoned village in the north of Vágar. Like the neighbouring community of Víkar, Slættanes is located in the most remote area of the island, and it is not ‘very easy’ to reach. 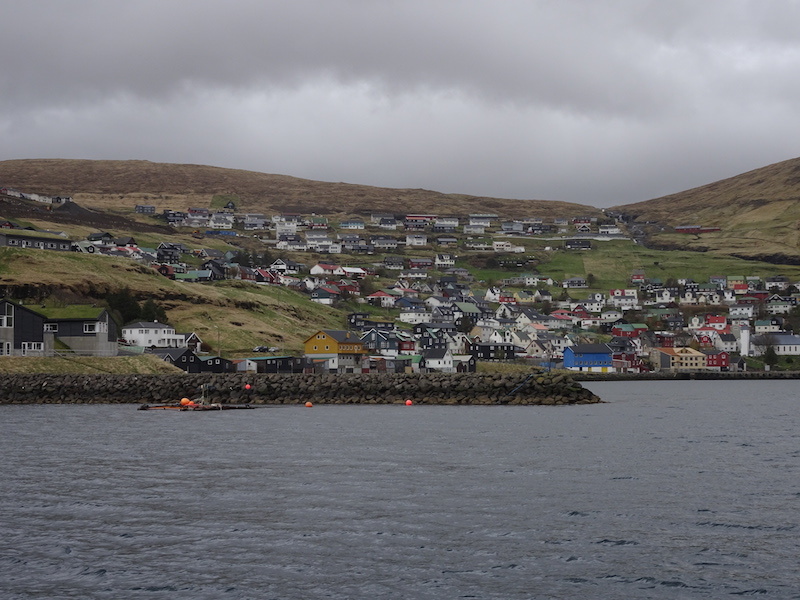 Both Slættanes and Víkar were permanent settlements until the 20th century, when their inhabitants gradually left due to their isolated position. 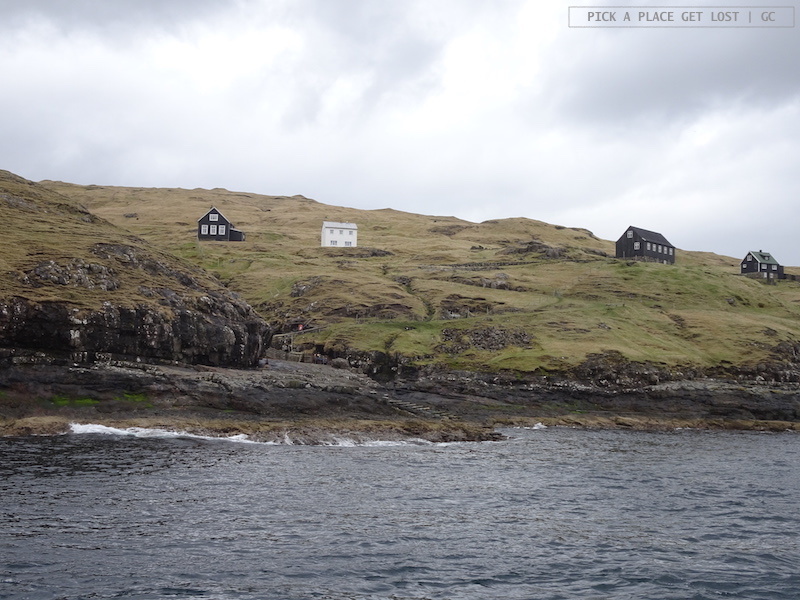 From the sea, Slættanes does look kind of similar to a ghost village: it amounts to a bunch of summer houses overlooking the ocean. It does not stand out in the landscape, yet once you see it for the first time, you can’t help noticing it. It exudes a silent, melancholic charm. Also, should you be wondering about sheep, well yes, we saw them as well. Sheep are really everywhere, and the way they effortlessly stroll down the steepest cliffs is truly unbelievable. It’s as if they said: ‘Gravity, in the face’ every single time. During the tour the sea was uber rough and the wind was blowing hard, so the boat rocked heavily the whole time. Standing on deck was like being on a rollercoaster. We stood in our spot the whole time, feet glued to the ground, one hand glued to the railing and the other holding the camera as steadily as possible. 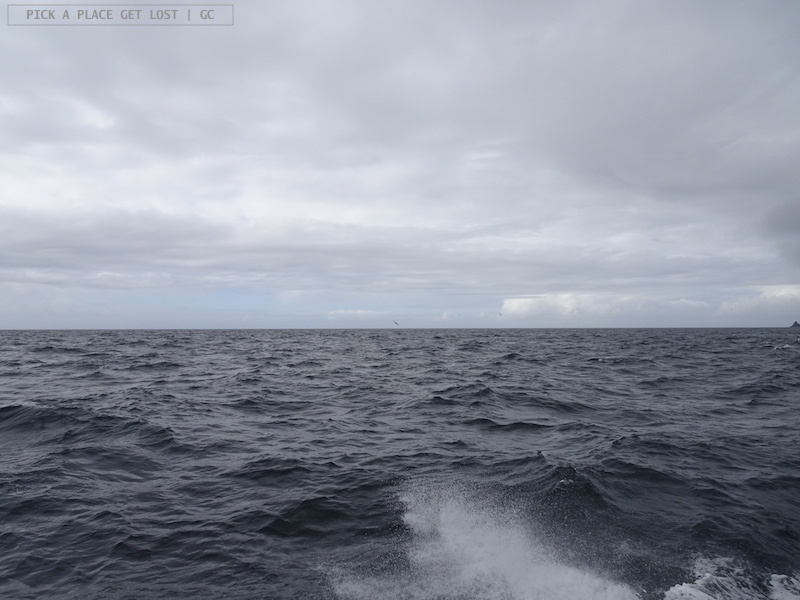 At some point we made a U-turn and started sailing back to Vestmanna. So we found ourselves on the side of the boat facing the open sea. At every wave the bow would go up slowly at first, then stop for a microsecond or so, and then it would suddenly plunge back into the sea. It was like a whip, splashing water all over the place. Every now and then I glanced sidewards to check on the captain in his tiny wheelhouse. I just wanted to see how worried he was by the high waves. 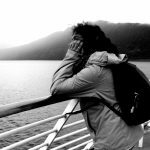 But every time I checked, I saw him piloting contentedly, cheerfully chatting with the other seaman or sailor (I’m not sure who he was) standing next to him. Good sign, I thought. I’m happy if he’s happy. The tour left us speechless and utterly mesmerised: how do you explain such overwhelming beauty with words? Needless to say, it also left us with soppy wet clothes and salty cheeks. It was one of the most exhilarating experiences ever! Literally minutes after we got off the boat, it started raining again, and it did not stop till… Well, I don’t know till when, because when our plane took off the next morning it was still raining. So yes, the rain did really only give us a break for as long as the tour lasted. That the Vestmanna tour was unexpected I can tell for sure. If I believed in coincidences, I’d also say that it was meant to be. 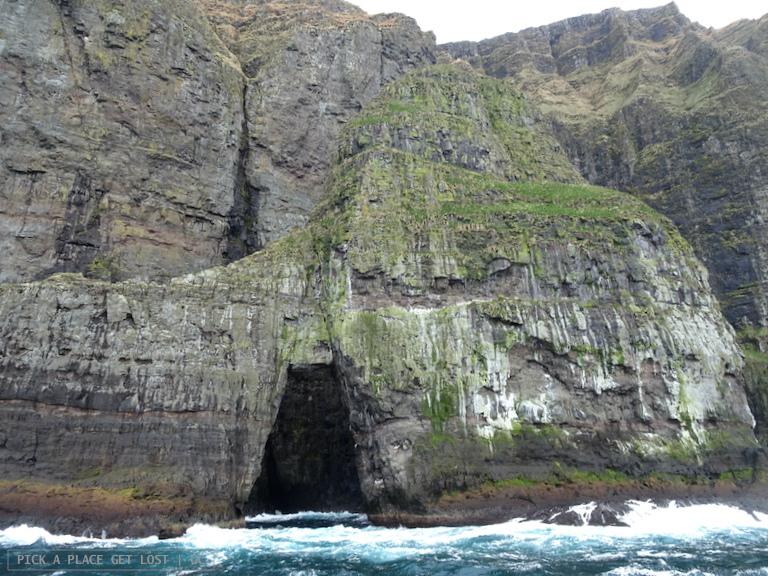 This entry was posted in Faroe Islands and tagged boat tour, faroe islands, streymoy, vestmanna, vestmanna bird cliffs by Giorgia. Bookmark the permalink.